Moll -Iapon or Niphon, The Land of Iesso and Straits of the Vries &c.
Moll, H. - Iapon or Niphon, The Land of Iesso and Straits of the Vries &c.
Iapon or Niphon, The Land of Iesso and Straits of the Vries &c. - Moll, H.
Title : Iapon or Niphon, The Land of Iesso and Straits of the Vries &c.. Size : 5.1 x 6.9 inches. / 13.0 x 17.5 cm. 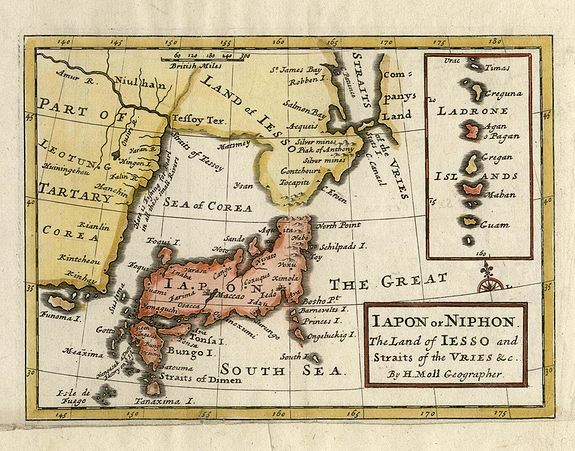 Description :This small, uncommon map of Japan, drawn on the Blaeu/Martini model, depicts a compact Honshu. The Land of Iesso is joined with the mainland and a faintly engraved coastline indicates that the region is unexplored. Korea is also merged with the Asian continent, so that it does not even appear to be a peninsula. The Sea of Korea includes a note that pearl fishing is done in all the small rivers entering the sea. An inset of the Ladrone Islands fills the region to the east of Companys Land. Condition : The narrow bottom margin has been extended to accommodate framing.